Monocoque Structural Laminate (MSL) fusion technology, making the board more rigid and a few pounds lighter. Now with increased bond strength and thickness of the second layer. NEW! Integrated threads for attaching optional RAM mounts and accessories. NEW! Updated graphics and logo. NEW! Internal redesign on the Titan pump for improved performance and efficiency. Now with reinforced handle bars. NEW! New foil liner added to the popular wheeled roller backpack for added protection against extreme heat. NEW! Improved US fin box now fits 90% of the US fins. New FCS Connect Tool-less Fin System for fast removal and easy set up. *US box fin system supplied with a fin for all-around paddling - for 2017, the fin box has been improved and now fits 90% of US fins. Also new is the FCS Connect Tool-less System for fast setup and removal with no tools or bolt necessary. The new fins have a specially-designed, wear-resistant barrel with a corrosion-resistant titanium pin mechanism incorporated into the base. An integrated nose runner fin increases tracking and straight line performance in side winds, while two rear fin runners prevent “tail drift” when the board is loaded with gear. *New integrated threads on the nose allow the attachment of optional RAM mounts, allowing the paddler to add numerous accessories such as camera attachments, GPS, phone and fishing rod holders. MSL fusion composite and airtight coating MSL involves fusing a second layer of hard-wearing polymer to the dropstitch core at the raw material stage, removing hand gluing errors. 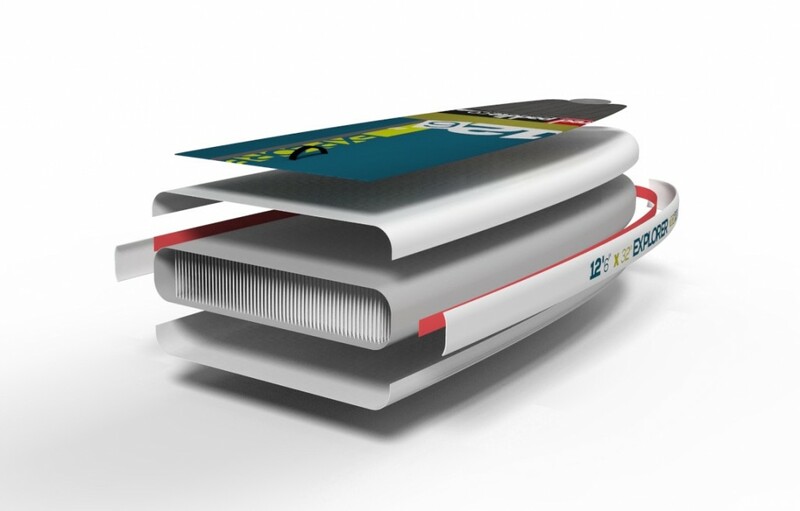 The high-tech industrial process also saves almost 2kg in weight and makes the boards stiffer at lower pressures. * The biggest change for is the weight change. The new Monocoque Structural Laminate or (MSL) layer makes the boards 4-6 pounds lighter depending on the model and also removes the potential for any bubbling. 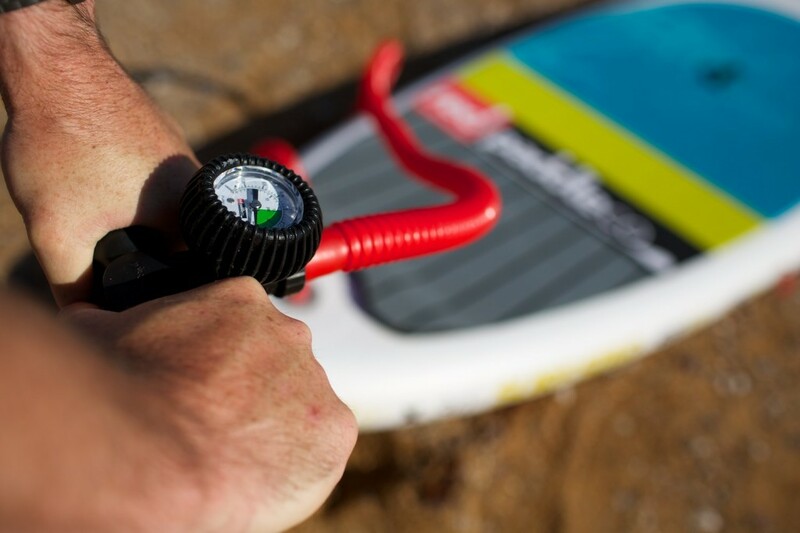 The Explorer comes complete with the best backpack in the business, a repair kit, waterproof phone case and the Red Paddle Co Tittan pump leaving you more time to paddle. 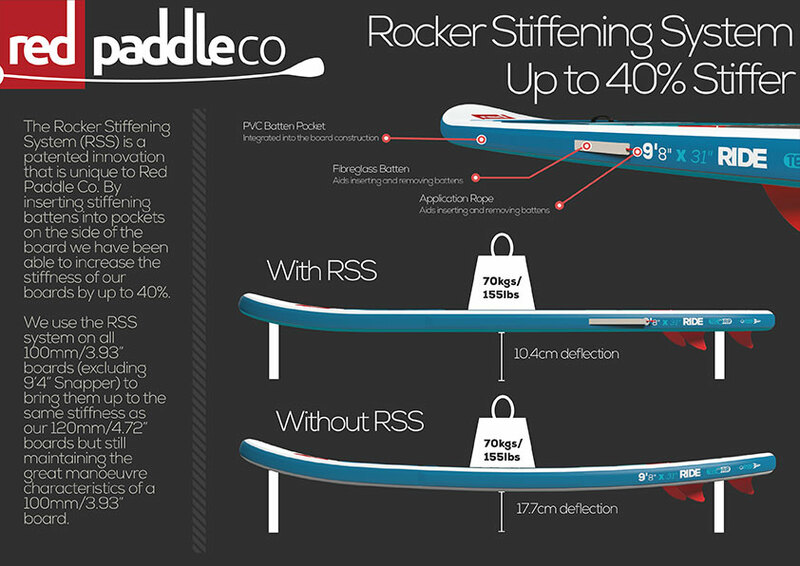 By looking at how and where a board flexes we have developed and patented the Rocker Stiffening System (RSS) to increase rigidity. It works by inserting stiffening battens along the rails of the board. The battens then work against the downward force of the rider to produce a stiffer board by preventing flex – similar to how a stringer works on a hard board. The stiffening strips are removable for easy board rolling and can be stored in the carry bag for transportation to and from the water. The 12’6″ Explorer is 150mm thick. This thickness is perfect for non surfing shapes. 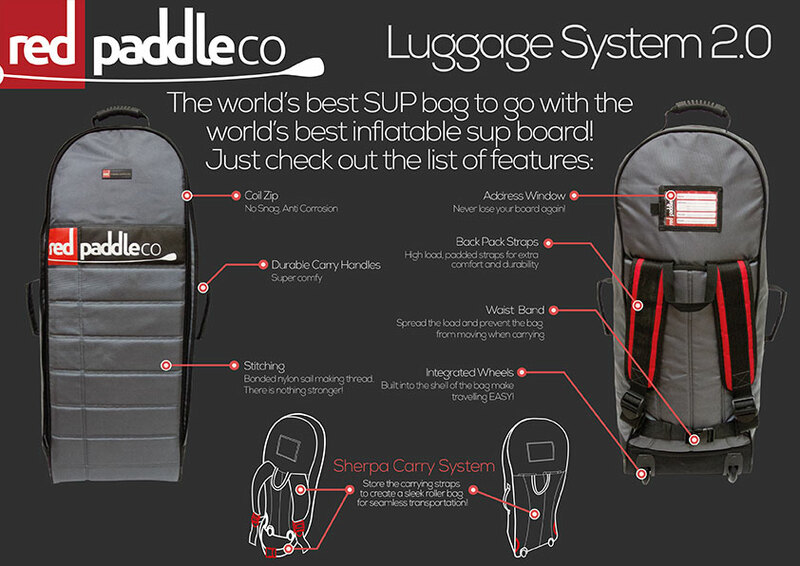 It gives great stiffness and means the Explorer board has enough volume to carry a lot of equipment.